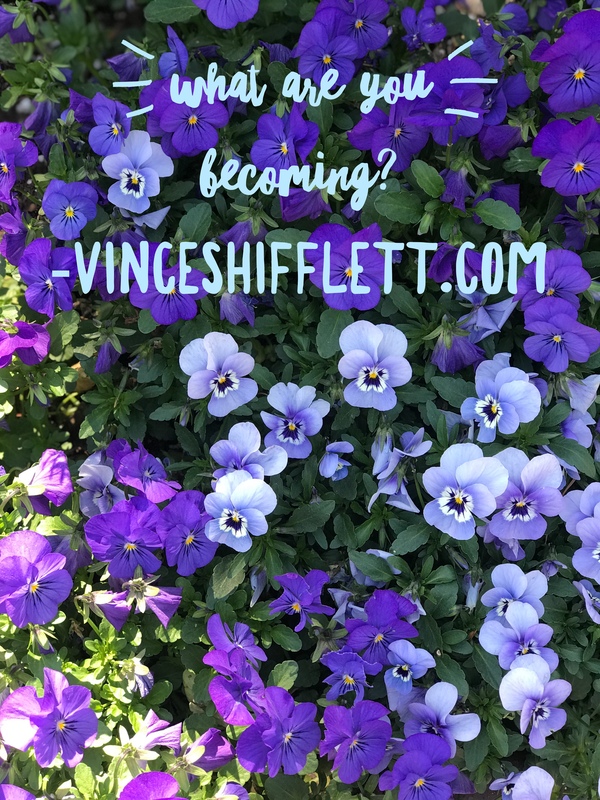 If one believes the notion that we are constantly changing, then it leads to the question, “What are you becoming?” Even though I am 56 years old, I still find myself occasionally wondering what I want to be when I grow up. Funny, right? When I asked myself, “What am I becoming”, I am referring to my character. In other words, What kind of person am I becoming? I think it is a good question to periodically ask oneself. I believe with each passing moment, we are each becoming. Becoming more loving. Becoming more annoyed. Becoming angrier. Becoming more joyful. Becoming more aware. Becoming something. Becoming implies it’s an ongoing process. Therefore, how does one develop character? How does one become? It certainly doesn’t happen over-night or instantaneously. It starts with the intentional repeating of the character traits you want to exemplify. It takes training your character to become what you want to become. In other words, if you want to become kindness, you must repeat acts of kindness over and over. If you want to be love, you must show love over and over. When you find yourself becoming the lead gossiper among your friends, co-workers, or family, be aware and decide to become peace instead. Reflecting back on my life, I have grown so much in the area of becoming. I used to be quick to react and respond. I have practiced more listening and stillness because that is who I want to become. I used to be more judgmental of people who were not like me. I have practiced more kindness and love towards all because that is who I want to be. It all starts in the brain. Your brain has is a dense network of many different pathways. It sends messages back and forth millions of times every second. When you practice something, you are creating a new pathway. Walking back and forth over that new pathway creates a deeper trail. On the other hand, neglecting that pathway, will cause it to fade. Walking that pathway of kindness leads to a character of kindness. Walking that pathway of love and acceptance leads to a person with a strong character of love. What are you becoming? For example, if you proclaim Christianity, are you becoming more Christ-like? It would be easy in today’s world to become angry, upset, jaded, and worried. There seems to be a lot of hatred and confusion exacerbated by our current political environment. Despite all this, we each have a choice as to what we are becoming. It is my intention to continue to become love and not hate. Peace and not war. Kindness and not cruelty, harshness or inhumanity. Honesty and not deceitfulness. What I am becoming has nothing to do with another’s behavior. I am responsible for only my character. I am solely responsible for what I become. Again, I ask what are you becoming? I look forward to your feedback as you ponder this question for yourself. We are born as a blank canvas. Our experiences and surroundings colour us into becoming ourselves. Some take the right path, some take the wrong path but we all get to our destinations at the end. No one actually knows what we are becoming. Today’s heart throb is tomorrow’s has been. But the important thing is to try and evolve into someone you would like to meet and chat to. I’m always evolving. I always try to do good. I look forward to the new obstacles that life throws in my path. However I am scared of each and every step I take, although I know that it will be beneficial to me in some way at some point. I am always really thankful for your responses. I would however encourage you to take your steps leaving the fear behind. You mention that you are scared of each and every step. Take those steps knowing that EVERYTHING happens exactly as it is supposed to. Worrying, fretting, or being fearful will not change the outcome but it can make the journey unpleasant. Breathe in knowing and breathe out fear. Knowing that God (Spirit, Universe) is ordering your steps. There is no right or wrong path. All paths are meant to be. They are lessons along the way. Even the paths we see as wrong are actually perfect paths in that we may not have grown or learned a valuable lesson had we not taken that path. Much love to you on your continued journey. Fill it with peace, love, and abundance. I love this! I always thought that by a certain age, we had become what we were going to become in life! Coasting afterwards….. Now, I know better! Awesome. What are we becoming? I asked myself that often. I find that change is great and wonderful. Our environment is a major factor. Love becoming a better person. Learning for past experiences of life and love. Looking forward to the next chapters of my life. Really appreciate the feedback. Always good to be aware of lessons learned so we can become better. I am becoming a better version of me daily: focus on inner peace, outward serenity and improved well being. I am so inspired by how you live your life. I love that you mention outward serenity. Keep living your best life. I believe with age, I’m becoming more aware of my life and those I share it with. You are so right. Age has a way of making us more aware of what is really important in life. I appreciate you.